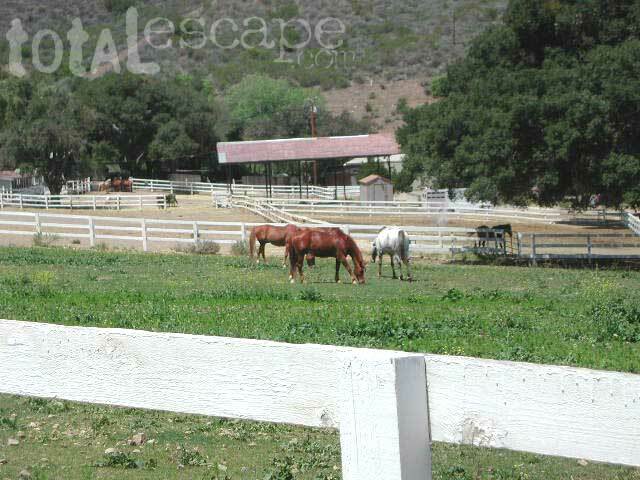 Rancho Oso Stables & Guest Ranch near Santa Barbara is located in a secluded canyon & is close to the Coastal Wineries. Stalls for your horses. Round pen & arena available. Thousands of miles of riding. Pacific Crest Trail nearby. Have over 20 horses available on the ranch for your riding pleasure. Lessons available. Children are welcome to ride gentle horses & ponies. 3 guest rooms; Outdoor Jacuzzi, Children's play areas, Clubhouse, basketball, volleyball.. Outdoor BBQ is available & use of indoor kitchen, dining, Bunkhouse & Tent Camping spaces. Campground with stalls & horse water; Riding on rolling hills. 60 Freeway to 71 expressway turn on Soquel Canyon Pkwy. & then left on to Elinvar Rd. then left on Saphire Rd. Park entrance dirt road. 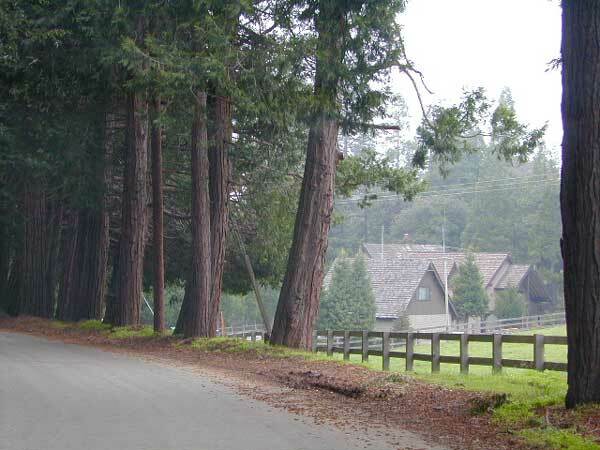 Equestrian Campsites @ Los Caballos Campground, 16 developed sites w/ 2 corrals ea. as well as tables, BBQ, piped water, restrooms w/ showers. Additional corrals are available at nearby equestrian day use area. California Riding & Hiking Trail. 20+ mi. of multi-use (hiking, biking & horse riding) trails, as well as a rustic ranch house built in 1927. 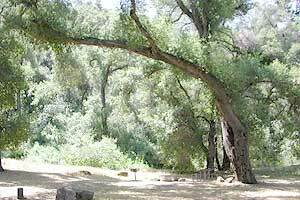 Trail map is available at both entrances, as well as at Dixon Lake. Main entrance is just N of Lake Dixon at the top of LaHonda Dr. The entrance for Cougar Pass Rd., 0.5 mile S of Alps Way. 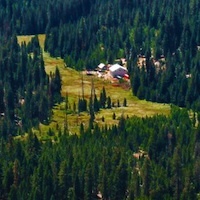 Completely private cottage is set atop a hill on a 40 acre ranch surrounded by mountain scenery. 1,400 sq. ft. cottage features 2 rooms with queen-size bed each with its own private bath. 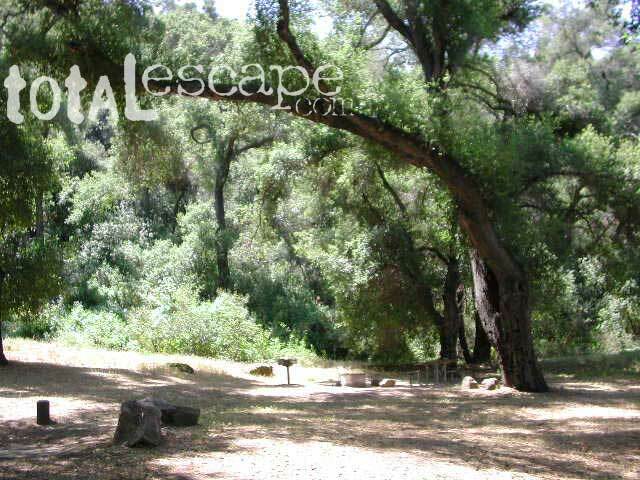 Close to Angeles National Forest, Jackson Lake, Mountain High Wrightwood & Pacific Crest Trail. Newly Remodeled 1 & 2 Bedroom Cabins, RV sites, Tent Sites. Showbarn & regular barns; all with large turnouts, paddocks, 1-5 acre pastures, tons of trails. Near Mountain High & Ski Sunrise Resorts, Devils Punchbowl. Pacific Crest Trail in Angeles National Forest . San Gabriel Mountains at elevation of 5400'. Direct access to trails. Stabling: 100x200 ft. paddocks, 12x12 box stalls or 12x12 box stalls with 12x16 runs. Dressage arena, wash racks, hitching rail. Charming cabin with complete bath & kitchenette. Porch. Queen bed. Pioneertown Motel, Plus Restaurants, Bars & Bowling! Near Pacific Crest Trail, Indian Flats Campground, and many unlimited trails. 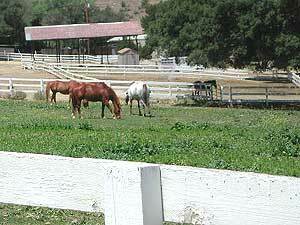 Cleveland National Forest 16 outdoor stables available, feed & arena on request, local ferrier. 6 rooms accomodating 12 or more people, kitchen, game room with pool tables & pinball, historic saloon with TV & dining space, electric & water, RV & trailer parking, BBQs. Next to the Los Padres National Forest , just north of Santa Barbara . Year-round accomodations; Cabins sleep up to 5 with twin/ full/ bunk bed. "Covered wagons" that sleep four on army cots. RV & tent sites available. 24x24 pipe corrals are within sight of the campgrounds; box stalls in barn for up to 6 horses. R.V. Equestrian & Wildlife Camping. Near Anza Borrego SP ; Desert, country store, trailers for rent, 285 full hookups, pool, |2 lodges & horse corrals. Three 11 x 11 ft. box stalls with adjoining, individual 15 x 30 pipe runs. Woodchips & feeders in stalls. Automatic waterers. Drycamp on our level rear acre. Secluded cabin on Kramer Meadow. Teepees, horse corrals, hiking trails.